Seven friends and I pool our money every year to buy about 8 bottles of Burgundy wine, wine that we wouldn't buy individually because of the high cost and the risk of bad bottles. Every year at around this time we get together over dinner and share the wines. This year the theme of our dinner was the great vineyards and producers of Pommard. 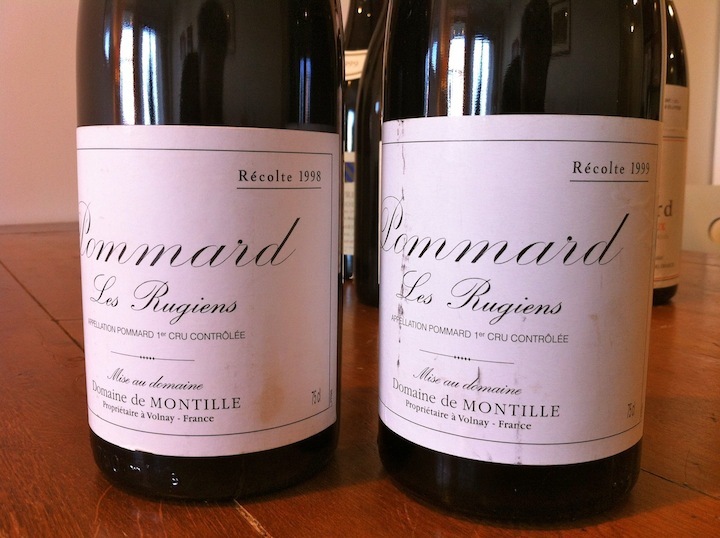 Pommard is not the most glorious of Burgundy appellations, not by a long shot. In my somewhat limited experience, the wines can be rustic and are not as pretty as the wines from neighboring Volnay, for example, or even compared with wines from "lesser" appellations such as Savigny-Lès Beaune. To continue with Pommard generalizations, the wines do not offer much value or particularly high quality at the villages level, unless the wine comes from a specific vineyard. For example, although I would not buy a straight villages Pommard, I might buy a bottle of Pommard La Chanière by Maréchale or Pommard Chanlins by Lafouge (although I don't buy those wine anymore either, but that's more about my own buying strategy than about the quality of those wines). People sometimes compare Pommard with Volnay, its neighbor to the south, and they say things like "Pommard is muscular and brawny, and Volnay is elegant and pretty." This is probably true as a generalization, although there are of course exceptions. People also say, when they talk about 1er Cru vineyards in Burgundy that should be elevated to Grand Cru status, that both Clos des Epenots and Rugiens in Pommard are deserving. For me, this is part of the point of selecting Pommard as the theme for our dinner. 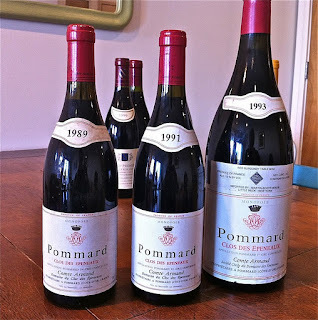 I wanted to drink wines that are considered to be among the very finest of the appellation, to experience Pommard at its best, to build the foundation of my own understanding of the character and potential of Pommard. 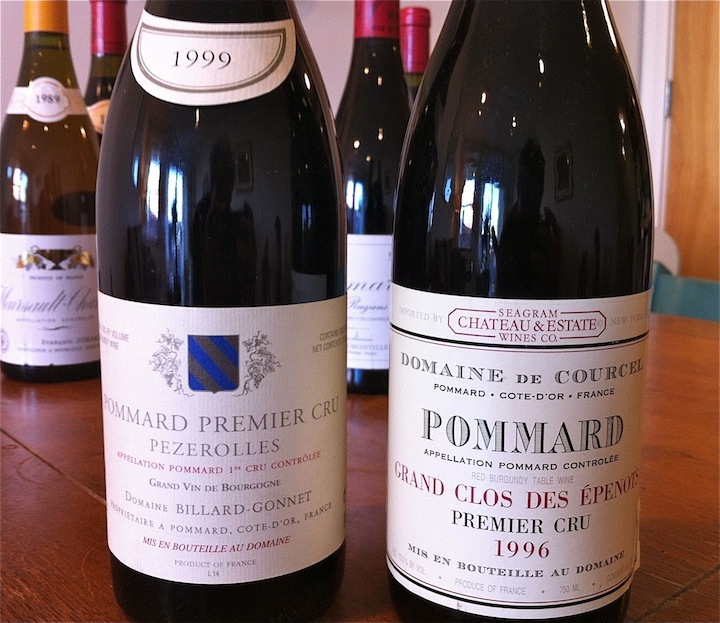 Any list of the finest wines of Pommard would include Comte Armand's Clos des Epeneaux. Epeneaux is a monopole of the Domaine, a walled vineyard of over 5 hectares within the larger 1er Cru vineyard called Epenots. There are two climats that make up Epenots - Grands Epenots and Petits Epenots, and Clos des Epeneaux is almost all within Les Grands Epenots. It's interesting to think about the fact that the previous owner of Clos des Epeneaux, the Marey-Monge family, actually owned all 30 plus hectares of Epenots in the early 1700's, and sold all of it off except for the Clos des Epeneaux, around which they built an 8 foot high wall and kept. Obviously they must have thought that it gave the best wines within the larger vineyard. Clos des Epeneaux wines comes mostly from old vines and, according to what I've read, need more time than most 1er Crus to arrive at maturity. We were all excited to have three examples of this wine to drink at our dinner, wines that could not be considered old, but would hopefully be mature. I also wanted to drink wines from the Rugiens vineyard at this dinner, and there are several producers who make good examples - Domaine de Courcel, Domaine de Montille, Aleth Girardin, Joseph Voillot, François Gaunoux, and Michel Gaunoux all come to mind. I chose two bottles from the late 1990's by de Montille. I've read that Rugiens is the richest, the most muscular of the Pommard wines, and that Clos des Epeneaux would be more mineral driven and elegant (although one experienced drinker at our dinner raised an eyebrow suspiciously when I mentioned this, saying that he would hardly call Clos des Epeneaux a wine of elegance, that is is still brawny Pommard). We rounded out our lineup by including bottles by two other producers whose wines I wanted to drink, as I read that they are made in a style that I would appreciate - Clos des Epenots by Domaine de Courcel and 1er Cru Pezerolles by Domaine Billard-Gonnet. First, the good news: we had a great night and I love Burgundy Wine Club. Such a great group of people, a pleasure to be with them and to look forward to this experience each year. We had a wonderful long dinner at the very lovely Rosewater in Brooklyn, where owner John Tucker serves thoughtfully sourced and prepared food, and has a very well selected wine list. 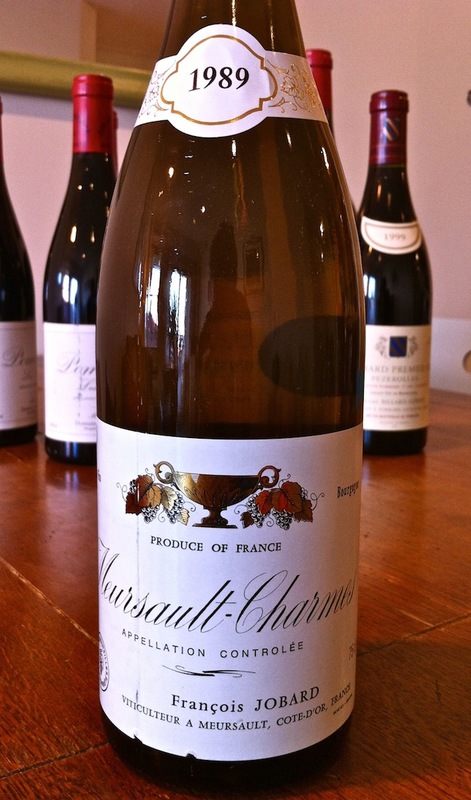 1989 François Jobard Meursault 1er Cru Charmes, $100. We drank this with a salad of grilled calamari with frisée, clementine, and bacon. The wine of the night without any question whatsoever. A fabulous showing for a wine that is drinking perfectly right now. Pungent and fresh at the peak of maturity. The nose at first has a roasted sense to the pear fruit, but the roastiness vanishes after a half hour and the wine becomes linear and focused with a perfect melange of fruit and mineral. Elegant, plush while remaining entirely in control, and great acidity - just a mouthwatering wine that reminded everyone at the table to drink more old white Burgundy. With grilled pork belly, apple, and pickled cabbage we drank a magnum of 1993 Comte Armand Pommard Clos des Epeneaux, $325. Oh, how I wanted this wine to be great. I knew that it would probably need a couple hours to open up, and we opened it at least 90 minutes before we began to drink it. It was dense and impenetrable for most of four hours, and never really opened up. There are hints of something lovely, but the wine is simply not ready, in the magnum format anyway. Some perfume emerges after while, but the wine is tight, inward. Time brings some animale undertones, but this bottle was in a disjointed state, with acid and alcohol not well integrated. There were questions from some drinkers about whether or not the wine was too cloudy. Some one poured a glass through a filter and the wine brightened some, but to me the smell and taste was unchanged. If I had another magnum I would leave it alone, honestly for another 10 years. With smoked quail, grilled radicchio, pinenuts, and currants we drank 1989 and 1991 Comte Armand Clos des Epeneaux, $200 and $168 respectively. The 1989 was corked, and this was crushing - on paper this wine should have been great. The 1991 could also have been flawed. There were clear signs of rot or mildew on the nose, which was musty and inexpressive. The wine was better with food, but the finish was cropped, stifled. Unsatisfying, not delicious, a big disappointment. 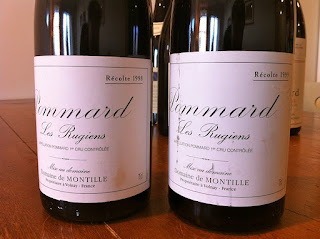 With braised shortribs, parsnips, shitakes, and mustard greens we drank 1998 and 1999 de Montille Pommard 1er Cru Rugiens, $133 and $185 respectively. The 1999 was delicious, but a bit too simple to be intriguing. It showed the ripe character of the vintage (one that I am learning to be skeptical of) with plush sweet fruit, not entirely enough structure, and very little complexity. Not compelling, I'm sorry to say, and a very poor value at that price. The 1998, however, was a very lovely wine. There were complex aromas of dark fruit, brown sugar, musk, and flowers. Lovely on the palate with pretty fruit and complex secondary flavors, and a long finish that pauses and then sneaks back up. 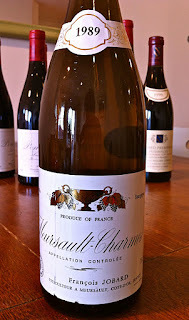 In this wine I could feel the muscularity that people speak of regarding Pommard. To me, this wine was exactly what it should be - complex, muscular, mineral driven, and it was delicious. Here is an article about Pommard from Burgundy Report. And here is the report from last year's BWC dinner, if you're interested. Just wanted to say that I really enjoy your blog. Can you tell me when you held your Burgundy dinner? I have been very fasinated with the biodynamic calender and have been charting the percentage of bottles that have shown well compared with the bottles that have shown poorly on non fruit or flower days. I would be curious to know if it was a fruit or flower day that evening you had the dinner or was it a root or leaf day? Perhaps even an interesting topic for your readers . Oh dear that didn't go very well. I have some problems with pommards. They hardly/never really sing to me. They can be ok but I never find the thrill in them that you can only find in some Burgundies. Then again I haven't been thrilled that much y Burgundies I drank lately. Very Good producers with prices to match. Luckily I'm not paying. But for the time latest Burgundies have been underwhelming, closed, subdued, moody, tight just no fun. Sorry you had to go through this but as you say it is all part of it. Hope you have better 'luck' next time. Btw I'm not convinced that leaving bottles alone for some more years will be the cure. Sometimes what you hope for just isn't there. Sorry to hear that your Pommard wine dinner didn't meet expectations. Although I never purchased a bottle, I still remember on my frequent jaunts to Paris in the mid-nineties that the then family-owned Legrand Filles et Fils always stocked Comte Armand along with de Moor, for instance. They only had five Burgundy domaines in their tiny shop. Pascal Marchand from Canada was making the wines at Comte Armand during this time. I must say that I no longer pine for that ultimate red burgundy experience. I don't pony up the Franklins to join in these events; too many disappointments over the years. Now, white burgundy I find more consistency and my better investment. Sorry about this experience. Drinking that Armand in magnum was certainly a no-no. And Montille wines under the regime of pere Montille were wines for very long cellaring. When did Marchand take over? I thought it was around 92-93? Stephen - it was January 7 - what type of day was that on the biodynamic calendar? 2GrandCru - I don't agree that there is a "right" time to drink a wine. It implies that there is some ultimately correct calendar for drinking a wine, which is nonsense - bottles are different, personal tastes are different, it all depends, it's not a science. We all have to learn how to anticipate what will be in the bottle at a certain stage of life, and no one saying when it is a no-no is substitute for personal experience. Cliff - Marchand took over in 1985 and then Leroux in 99. I just looked it up and it was a root day which if you believe in the calender then it was a day to avoid. I recently conducted a little tasting where I opened up several 20+ year old California Cabs and Northern Rhone reds. The same set of wines were opened on different days 1 week apart. The first flight was opened on a root day and the exact same wines again opened a week later on a fruit day. I conducted this experiment with some friends who thought I was out of my mind when refering to the Biodynamic calender. The wines showed completely different on these 2 days. Every single one. On the Root day they appeared tired , liveless, no essence or energy , devoid of the beauty that I expected from each one. On the fruit day they tasted completely different. Alive, complex with amazing energy and terroir driven characteristics. Everything that I had expected from these wines appeared on the Fruit day. Coincidence? Perhaps. It's an experiment worth considering. Personally I will not open any great wines unless it is a fruit or flower day. As the calender goes there appear to be between 12-14 days a month for such opportunities to open top wines. I can recommend a small pocket size guide called WHEN WINE TASTES BEST, A BIODYNAMIC CALENDER FOR WINE DRINKERS. It can be ordered on Amazon. Well worth the search. Let me know if you can't access it and I will send you a copy. Your blogs are fantastic. keep them coming. Stephen - thanks for the reminder about root days, etc. This topic keeps coming back and I am ready to start taking it a bit more seriously. I am going to buy that book. Hello Brooklyn Guy - we spoke a few years ago about the Lafouge domain. What a shame for you about these wines from some of the best cellars in Burgundy. I drank the Lafouge Pommard Village 2005 at Christmas with ratatouille lasagne & montbeliard sausage! It was just wonderful, rich & fruity . I don't believe personally that the reds from Cote de Beaune stack up to some of those in Cote de Nuits, but I have had some superb Pommards from the lesser domaines and thse from Lafouge are as good as any I have tasted. Wish I could join your wine club - it sounds fun! First of all - thanks for a wonderful blog! Read your piece on scoring - very interesting! Brown Sherries Improve After Opening !